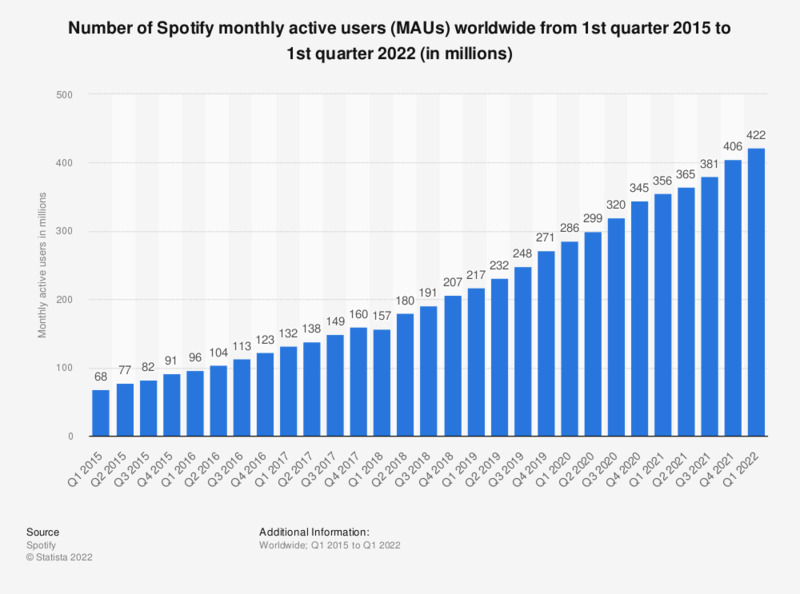 This statistic gives information on the number of monthly active users to Spotify's music streaming service from the first quarter of 2015 to the fourth quarter of 2018. In the last presented quarter, the music streaming service reported 207 million active users worldwide. Spotify is a music streaming service that offers digital audio content. Basic audio content can be accessed for free whereas premium user subscriptions enable users to access offline mobile content as well as listen to music without advertising. During March 2017, the company announced 50 million paying subscribers. Launched in 2008, Spotify originated in Sweden before expanding to European markets and the United States in 2011. Spotify’s U.S. launch was strongly marketed through Facebook, with the music streaming app profiting from the social listening integration via social media. Part of Spotify’s appeal are the user- and brand-curated playlists, which can be shared publicly or between friends. As of March 2017, the most-streamed weekly track on Spotify worldwide was Shape of You by Ed Sheeran.